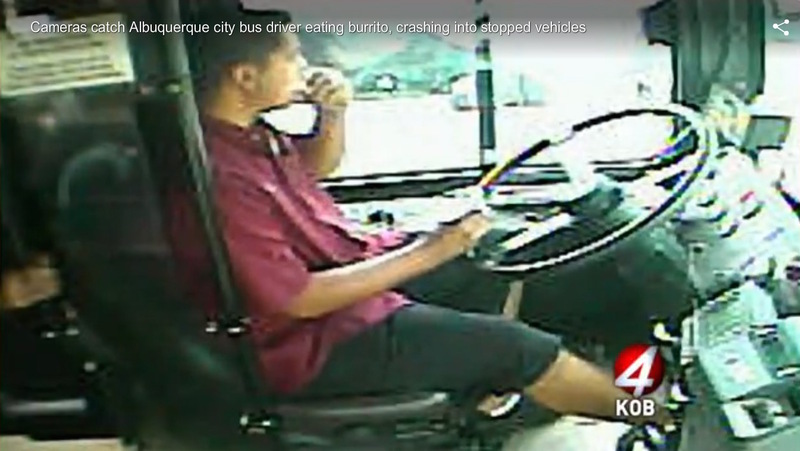 Burrito-eating Albuquerque municipal busdriver Jeremy Perea apparently picked a bad moment to take his eyes off the road – traffic in front of his vehicle had come to a halt. Albuquerque city bus driver Jeremy Perea faces a lawsuit for distracted driving – eating a burrito and sipping a drink while behind the wheel. But it’s what happened just seconds after he finished his meal that got him in hot water. Cameras onboard the bus caught Perea eating while northbound on San Mateo, just south of Central. There’s no trouble at first, but just moments later, those peoples’ ride to somewhere ended up going nowhere. Just as the bus starts picking up speed, Perea sets down the remnants of the burrito, takes his eyes off the road, and doesn’t realize the line of cars that came to a stop ahead of him until impact. The crash happened in July 2014, but one of the people who was hit by the bus says they were hurt and recently filed a personal injury lawsuit against the city. That man and his attorney have documentation claiming Perea was texting while driving, but after KOB showed them the bus footage Wednesday, they learned differently. Attorney Rachel Berenson only saw the video after KOB obtained it through a public records request. “That is incredible!” she said.